Antique Gun, Sword, Weapon and Artifact Dealer. We appraise, identify, authenticate, buy and sell Historical Weapons and Artifacts. 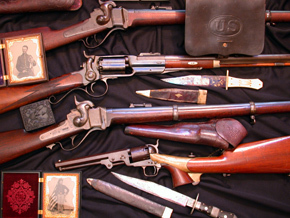 Michael Simens is a Nationally recognized authority and resource for Antique Colts, Civil War and other firearms, swords, weapons and related artifacts. Michael Simens has bought, sold and collected some of the most important Antique Sword, Firearm and Artifact collections ever brought to market, including the well known "Richard Johnson Collection of American and Civil War Swords" and the "Fred Toedtman Collection of Antique Colt Firearms". He has also handled some of the finest investment quality Presentation Colts, Winchesters, Volcanics, Sharps, Smith & Wessons, Civil War Guns, Swords, Uniforms, Artifacts and U. S. Martial Arms ever offered for sale. 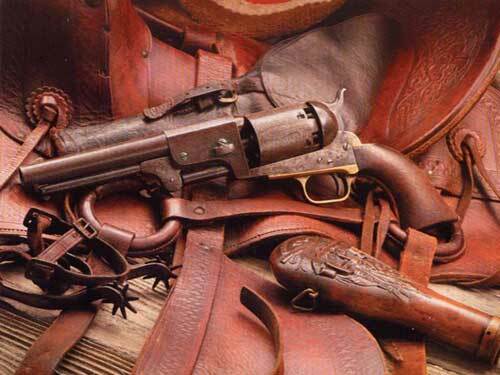 Contact us when considering the purchase or sale of Antique Guns, Swords, and Artifacts and entire Collections. Michael has been acknowledged by the authors of several works on collector arms to include "The Henry Rifle" by Les Quick, "Civil War Swords" by John Thilmann and many Colts in his personal collection grace the pages of "The Book of Colt Engraving" by Larry Wilson. Winning many awards for his displays of fine Arms and Artifacts at the top Antique Arms shows across the United States, his clients include a premier list of individual collectors as well as several Historical Institutions, and he is a past or current member of most every major organization devoted to Antique Arms and Artifact Collecting to include the C. C. A., K.R.A., O.G.C.A., C.A.D.A., P.A.G.C.A., M.A.A.A.A., T.G.C.A., C.W.D.A., N.S.T.C.W., N.R.A., etc. Michael Simens Philosophy, "I am a fellow collector of Fine Antique Guns, Swords and Artifacts. As such, I am more interested in acquiring new customers who share these interests than in making a sale. For these reasons, I try to make certain that every customer (be they buyer or seller) be dealt with fairly and with complete satisfaction in every transaction". We are always looking to buy Historical Artifacts to include Guns, Swords, Flags, Medals, Saddles, Uniforms, Cannons, etc.. No Antique Arms or Artifact Collection is too big or too small for our purchase consideration." 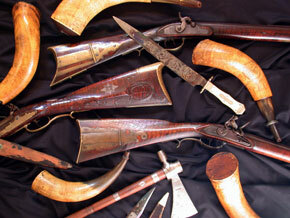 Contact us to learn why we are the best venue to sell your gun, sword or artifacts collection. NOTE: The items on this website are antique collectibles manufactured prior to 1899 and are considered "obsolete" and "antiques" by the United States Government. Please refer to our "Terms and Conditions" page for further information.